Scarlets coach Wayne Pivac says flanker James Davies has been approached to play in the sevens for Team GB at the Rio Olympics. 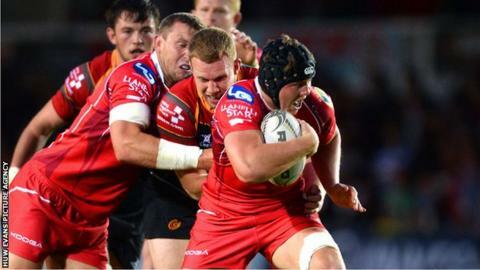 Uncapped open-side Davies, 25, is the younger brother of Wales and British and Irish Lions centre Jonathan Davies. Pivac said: "He has been spoken to I believe, who by I'm not too sure". Sevens is included in the Olympics for the first time this year - with rugby having last appeared at the 1924 Games in Paris. Davies has played sevens for Wales, but if he receives an Olympic approach he may face a difficult decision in June when the full national team have a three-Test trip to New Zealand. With Ospreys open-side Justin Tipuric already ruled out of the tour, Davies is among the players likely to be considered by coach Warren Gatland as understudy for captain Sam Warburton. However, two GB Sevens teams will compete in four international sevens tournaments during June and July as preparation for Rio - clashing with the New Zealand tour. Pivac described Davies as the "ultimate sevens player", but added he faced a decision about the direction his career might take. "It's about the big picture in terms of his career and he needs to decide if he wants to be a sevens player or a 15s," said the New Zealander. "He's in a different position so somebody playing regular Test-match rugby. "There's also the potential selection in 15s. "It's nice to have possibilities on the horizon, but we have to manage the players as well. "All those things have to be factored in, but he actually has to be selected for one of those sides before he has a decision to make." Welsh Rugby Union chief executive Martyn Phillips has said that any player selected for Team GB would "go with our blessing".